Here we are again, for another exciting editing of the North Dakota United Legislative Update! Or at least as exciting as a Super Bowl halftime show. I’m your host, Kelly Hagen, director of communications, and, of course, you can contact me at any time by e-mail, kelly.hagen@ndunited.org, with your questions, comments and requests to put a few more commas in this sentence. Quick note before we get started. You may have noticed, our companion NDU Legislative Update video on Facebook Live with NDU President Nick Archuleta and Public Affairs Director Tom Gerhardt did not air this past Friday. President Archuleta was in Washington, D.C., helping to present the Horace Mann Award for Teaching Excellence and $10,000 to Leah Juelke of Fargo South High School on Friday on-stage at the NEA Foundation’s Salute to Excellence in Education Gala. 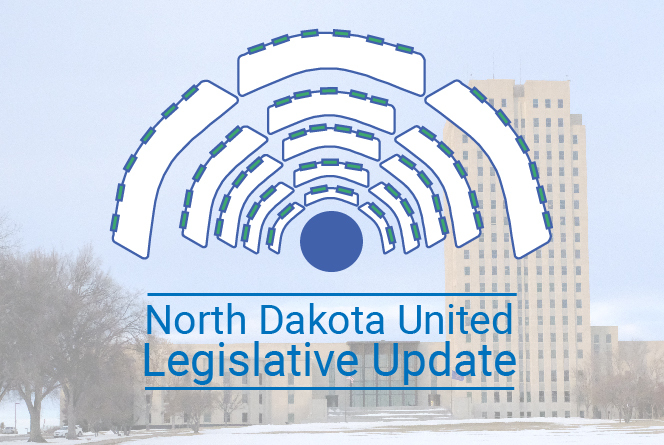 So this is your exclusive spot for all the ND United Legislative Updating you can handle for this week, and we will welcome Nick and Tom back to the Facebook Live airwaves again later this week! NDU President Nick Archuleta answers a question from Sen. David Rust (Tioga) on SB 2228, which would put fall administrators conference to same days as DPI teachers conference. We all know the value of professional development to all workers, don’t we? In short, employers are making an investment every time they hire an employee, and you get a bigger, better return on that investment if you train that worker to be the best possible employee they can be. North Dakota United is among several entities that offers professional development to educators, and we have historically offered, or assisted with, one statewide conference for PD each fall. We expect the Senate Education Committee to take action sometime this week, and we are hopeful that Section I will be amended out. 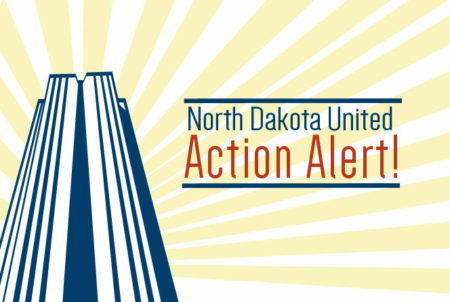 The North Dakota Legislature already controls a whole lot of things, such as pay raises for state employees and faculty and staff at our institutions of higher education, the health insurance plans these employees are offered, retirement benefits, the minimum wage offered to all workers, when businesses can open on Sundays, where and how we distribute straws and plastic bags to people, what color t-shirts North Dakotans are allowed to wear each Thursday during spring months (I made that last one up), etc., etc. You know what they don’t have control over yet? Tuition rates for college students. So some legislators naturally want that, too. This bill saw plenty of opposition in committee, from the North Dakota University System and from Bismarck State College President Larry Skogen, who asked, “Will this body know for successive next two years what will be the student portion to operate each institution and how timely will these decisions be made?” The committee did not take action on this bill. During the interim, Gov. Doug Burgum brought together a task force to look at the governance of our state’s 11 public universities, and HB 1500 is the result of that task force’s findings. This bill called for creating three boards of governance, instead of the one we have currently. 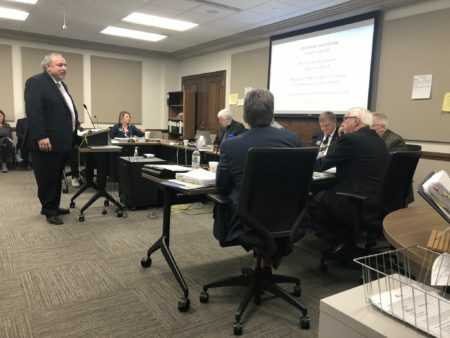 During testimony for the bill in committee, Rep. Shannon Roers-Jones offered an amendment to change that number to two boards instead of three: one for the two research institutions, University of North Dakota and North Dakota State University, and one for the other nine institutions. The House Education Committee gave this bill a 9-4-1 “do not pass” recommendation, and is expected to come up for a vote by the full House soon. We’ve heard some talk about another delayed bill coming through to make some changes to the current one-board system. Stay tuned? Please continue to stay tuned in for action on HB 1347, which would remove rights of representation for new educators and increase the period in which they can be fired without cause from one year to three years. We will be sending out an Action Alert on that bill as soon as we have a date certain for when the House will be voting on this one. While you wait, please take the time to use the Action Alert form we’ve created for a whole gaggle of bills that would allow guns into schools and other public spaces. On Thursday, the House Energy and Natural Resources Committee (because why not that committee?) will be considering several bills on the subject. The key bill we’re keeping an eye on is HB 1332, which would allow schools to launch “armed first responder” programs, which would allow individuals on staff to participate in the program, attend training and then carry a firearm concealed onto school property. The Legislature needs to consider your viewpoints on this subject, and this form will allow you to easily send your personalized perspectives directly to the members of the House ENR Committee. Please be respectful in your communications. HB 1463 – “For an Act to provide for collective bargaining for law enforcement officers and paid full-time firefighters.” A bill to grant collective-bargaining rights to police and professional firefighters reached a disappointing conclusion on Friday, Feb. 8, as the House defeated HB 1463 by a vote of 64-23. We were all saddened to see this result, and to hear the misperceptions that so many of our legislators have about collective bargaining. This process allows our K-12 teachers in the state of North Dakota to have a voice in shaping their working conditions. We will continue to stand behind our brave men and women in law enforcement and firefighting, who literally risk their lives every day on the job in service to all of us. 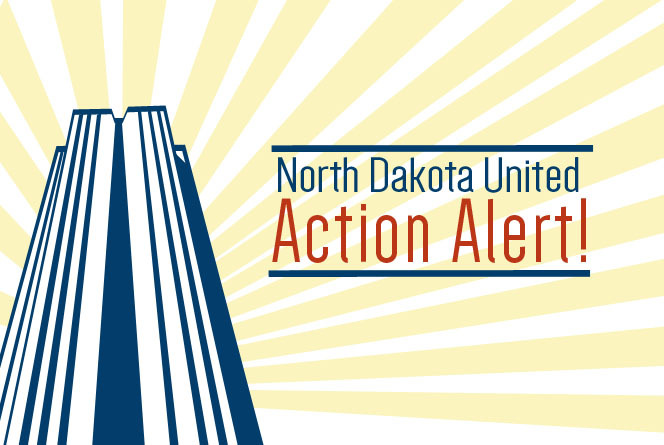 SB 2227 – “To provide for a transfer from the strategic investment and improvements fund to the public employees retirement fund.” This would allow the Office of Management and Budget to transfer $265 million from SIIF into the ND Public Employees Retirement Fund. It’s been referred to Appropriations Committee for a hearing tomorrow at 10:00 a.m., and President Archuleta will be testifying in support. HB 1028 – “Relating to public employees retirement system self-insurance plans for health benefits coverage.” This lays the groundwork for PERS self-insurance. It’s already passed the House, 92-0, with an emergency clause carried, so the Senate received the bill and held a hearing on Feb. 6 in the Industry, Business and Labor Committee. Again, let’s just be careful. That’s all. Well, I’m all out of stuff to write. Again, I’ve been Kelly Hagen, your NDU Communications Director, this whole time. Send me a note if you want to talk about anything. Don’t send memes. Those are troublesome. Have a great week! Thanks! And you can go ahead and stop snowing in Bismarck any time now, sky!